We’ve all heard of The Jackson 5 – the group (comprised of five Jackson brothers, including the late “King of Pop” Michael Jackson) was well known for their hit soul songs, “I Want You Back” and “ABC.” Other notable family musical acts include The Bee Gees (“Stayin’ Alive,” anyone? ), The Osmonds, America’s “MMMBop” band Hanson, and more recently, The Jonas Brothers. I’ve got to say, I love me some good music with any musical act. However, there is something special about ones whose members are keeping it within the fam. With the rise in social media use, many up-and-coming musicians are looking towards YouTube, Twitter and Facebook as platforms for sharing their music to the masses. Here’s a rundown on some of the acts (strictly related) that have caught my attention. Megan & Liz consists of Megan and Liz Mace, fraternal twin sisters who are now based out of Los Angeles. The Michigan-born duo uploaded their first YouTube video in 2007, an original song entitled “This Note.” Since then, they have posted over 80 covers (their version of “Stereo Hearts” has over 7 million views), released enough original music to span a few EPs, garnered over 950,000 channel subscribers, started a beauty channel (focusing on style, beauty and miscellaneous tips) and recently headlined the American Rag Tour across North America. Their debut album, Look What You Started, which has taken inspiration from their broad musical interests including Florida Georgia Line, Skrillex and Marianas Trench, is slated to be released later this year. 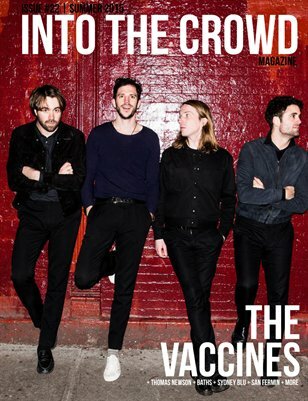 Currently listening to: “In the Shadows Tonight” – the new single is available for purchase off iTunes. Kings of Leon isn’t exactly new to the scene. The alt-rock band (consisting of Followill brothers Caleb, Nathan and Jared, with their cousin Matthew) was formed in 1999, and released their debut album, Youth & Young Manhood, in the summer of ‘03. Let’s fast forward ten years; the group has since released four more albums, won a Grammy Award for their chart-topping “Use Somebody,” taken a sabbatical following band tension, and is now back with their sixth album, Mechanical Bull. The new release, whose songs could be described as “all across the board,” (with influences from Sly and the Family Stone to Queens of the Stone Age) will be released on September 24th. Currently listening to: “Supersoaker” – the lead single off the new release! Aussie brothers Keith and Michael Jeffrey form Atlas Genius. The indie-alternative band formed in 2011, with their debut single, “Trojans,” peaking at number 4 on Billboard’s Alternative Songs chart. Soon after, they had gained the interest of many different record labels, and ultimately chose to sign with Warner Bros. Records. The group’s debut album, When It Was Now, (which has been described as “Phoenix-like dance pop”) was released earlier this year. They can next be seen headlining a North American tour from late September to mid-November, and then working on some new material early next year. Currently listening to: “Symptoms” – but let’s face it, I could listen to any of their songs on repeat! This group of six is no stranger to the powers of YouTube. The Cimorelli sisters (Christina, Katherine, Lisa, Amy, Lauren and Dani) began uploading videos to their channel in ’08. In 2010, they hit 100,000 subscribers. To date, they now have over 2 million subscribers (and counting), a record deal with Universal Music’s Island Records, won a Teen Choice Award, performed on Good Morning America, and have released 4 EPs. Their latest, Made in America, contains four of their originals, which all but proves their strong harmonies (after all, they did get their start by posting a capella covers). Currently listening to: “Wings” – listen to the acoustic version, it sounds great. Echosmith hails from California, and features Sierota siblings Jamie, Noah, Sydney and Graham. The young band (their youngest member is 14) spent the past summer playing for large crowds on Vans Warped Tour, and recently opened for Owl City on his Midsummer Station Tour. The siblings, who “grew up in a super musical household,” take inspiration from Joy Division, The Smiths and Coldplay – if that gives you any indication on how sweet their music sounds. Their debut album, Talking Dreams, is slated to be released October 1st via Warner Bros. Records. Currently listening to: “Come Together” – this track gives off a mellow vibe, I dig it. Brothers Alejandro, Fabian and Daniel Manzano are Boyce Avenue, an acoustic-alternative band based out of Florida. They began posting covers on their YouTube channel in 2007 (their version of Rihanna’s “Umbrella” has over 10 million views), and quickly gained fans worldwide. Unlike the acts above, the group releases music through their very own record label, 3 Peace Records (they signed English singer-songwriter Hannah Trigwell last October). The “most viewed independent band in the world” released their newest album, Live in Los Angeles, in August, and will be embarking on a world tour this fall. Currently listening to: “Find M”e – the Live in Los Angeles version, which is available on iTunes, Spotify, or YouTube (for your viewing pleasures).